It’s definitely feeling and looking like summer here in Florida! 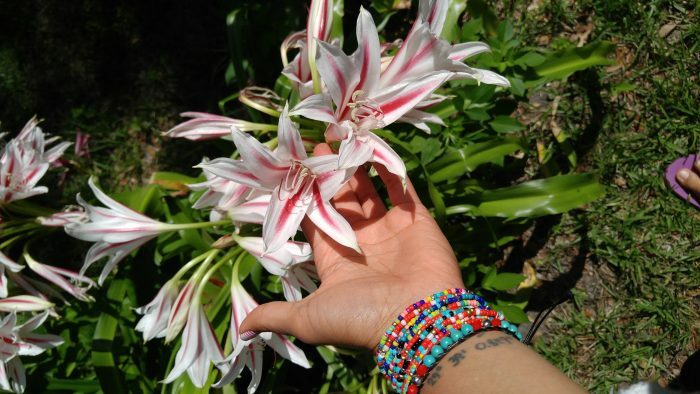 The amaryllis flowers are blooming around the front yard. Aren’t they pretty?! 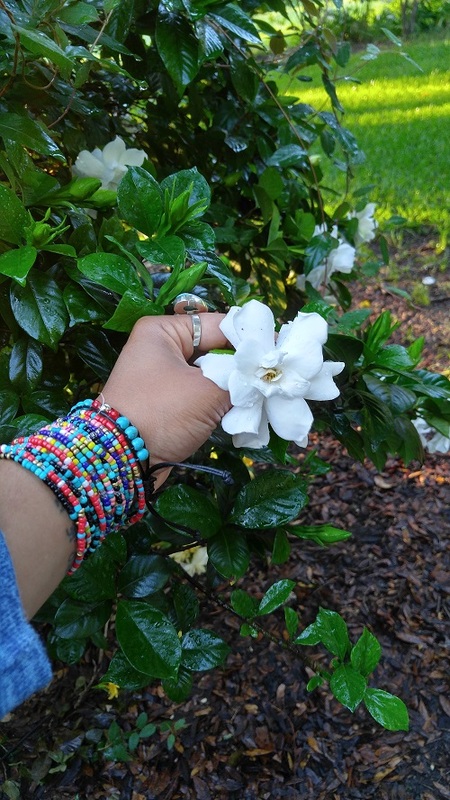 Our gardenias are blooming and the aroma is so lovely as you’re walking in the house. And now… some big news! Baby Cutes, our mini nubian (Nubian/Nigerian Dwarf cross) is pregnant! The vet came with her ultrasound machine and the kids and I saw not one, but two babies on the screen! 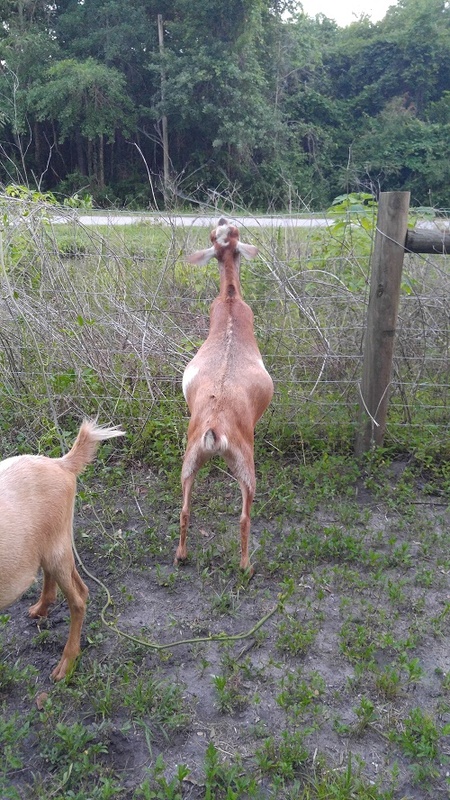 I wish I had taken some pictures of it all but I was the one in charge of holding the goat steady so the vet could do the ultrasound. But we are super excited and we are all crossing our fingers and hoping for healthy twin kids later this summer. I will keep you posted! Baby Cutes and her pregnant self! She is growing sideways and bigger every day! TWINS! Another pic of Baby Cutes and her growing belly! In homeschool/ unschooling news Allie decided she wanted to make her first Barbie doll dress. She chose four charm squares from a pack she had been playing with and found a strip of ribbon in her room and voila! 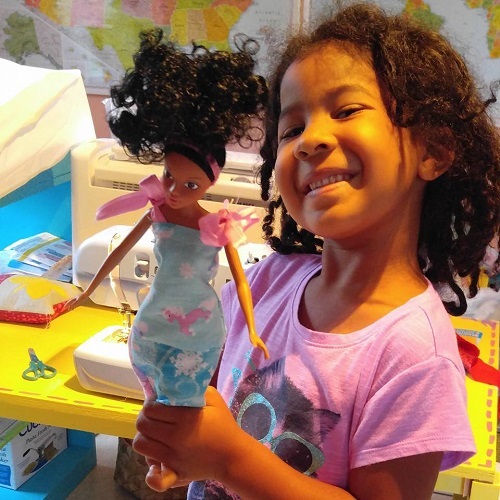 In less than 30 minutes she whipped up a super cute reversible midi dress for her Barbie doll. It was definitely a close call trying to get it over her hips and shoulders with no closure but we made it work. She is so good at sewing on a machine that it blows my mind! You can watch a video of her skills here. Allie on her new-to-her sewing machine. She now uses Juice’s hand-me-down since he was upgraded last Christmas. She loves it! This machine is no longer manufactured in this color but here is another option on the same machine. • Stop sewing when you reach a pin. • Do a great job so you don’t mess up and have to start over. I’m so proud of her! She did a fab job on her Barbie dress and what a joy it is to sew with my kids! I love that they enjoy creating too! 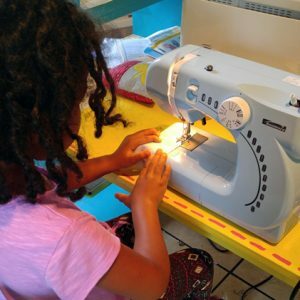 Check out the video of Allie sewing and giving beginner sewing lessons in my Facebook Post. That about sums up what’s been going on the farm and with the kids this week. To stay up on all our happenings be sure to subscribe to my email newsletter right HERE. Thanks, Vanessa – I love peeking into your great family farm life. The little kids (four footed ones) will be adorable. I worked at a farm camp and the kid goats loved climbing on structures so maybe you can build a little goat climber while you and the kids are waiting for the OTHER kids to be born. Ramps with cleats, platforms, etc – just like a cat climbing structure only big enough for goats. Mary Patrick Thank you so much for your email about the Kelley Cross-body bag I didn’t realize I needed to go to my emails. I am very sorry I just didn’t know how to download your patterns as I’m new to your sight. I love the way you instruct how to sew quilts as well as purses. You taught me to make my first envelope pillow and I have made several since you have posted the tutorial. All my family have loved there pillow creations and I owe all to you Vanessa. You will have to forgive me sometimes I don’t do so well with the computer I think it is for the young people out there. I would be interested in the dresses for dolls patterns as I have a granddaughter that just loves barbie doll clothes. I want to make her some clothes but just don’t if I can make something so little. I love to quilt and love charm packs! You are doing a wonderful job and I really enjoy each tutorial. Keep on sewing!!! We are taking delivery of our first Dwarf Nigerian Goats and we are SOOOOO excited! 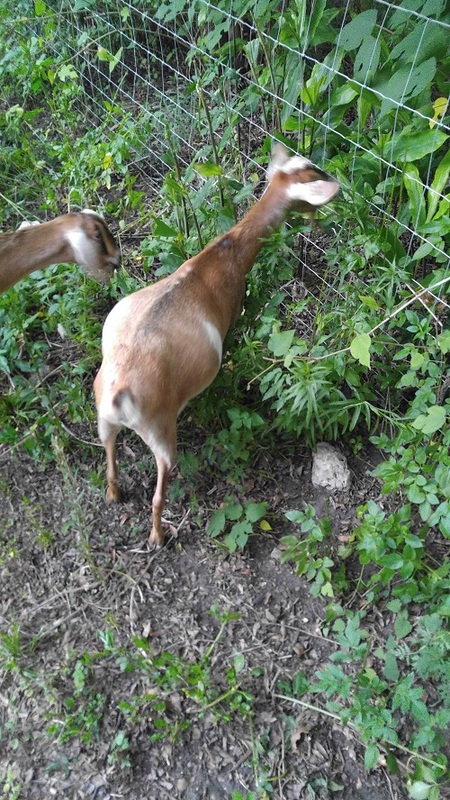 We are a small homesteading family of 3 and our passion is our family members, our new goats and our 15 chickens. (you can never have enough chickens, right, lol) We love them. When I sit on the upside down Tractor Supply bucket, in the middle of their run, their little sounds are so soothing. I tell my husband, “they are my therapy”!! Im planning on trying the “non-paper towel” towels for my family since we go through a lot of “paper” paper towels it becomes quite costly for us. So the cloth ones are a great option.